Google Chromecast is here! The tiny device from the search giant Google was released earlier this year and is selling like hotcakes. Ridiculously low priced at $35, Pocket-friendly, Easy to set up, Sky-high potential, Ever-growing list of partners – its an investment that you won’t regret. Alright, so after quite a bit of research and thoughts, I bought the Google Chromecast from Jadopado.com (they did a great service by delivering it from Dubai to Doha within a day’s time! Great packaging, great service and a nice website) Now the obvious question. How to set this up? How does this USB-sized HDMI-ended stick work wonders as it’s advertised. Learning by Doing, isn’t it? Yup. So, I went straight ahead and decided to check it myself and test the device right away. Before we jump into it, let’s have a small introduction to this awesome device at hand. I also hope this would clear some of the doubts and queries you might have with Chromecast. To begin with, what is Google Chromecast? It’s practically a dongle which will act as a medium between your normal TV (yes, no need to have a Smart TV) and your mobile device/tablet/laptop, and lets you play/stream videos and contents from supported apps, websites and Google Chrome web browser to your TV. Once you set this up, you can go ahead and stream a video directly to your TV and enjoy them in a bigger and better screen. Isn’t it great? Mmm… so what are these supported websites/apps? Well, this list is still growing. Chromecast is still in its early days and only a handful of apps are available at the moment. But every few days, new websites and apps are extending their support to Chromecast and are offering their services through the device. As of now, the notable services include Youtube, Netflix, Hulu Plus, HBO Go, Pandora, Google Play TV & Movies, VEVO, RealPlayer Cloud etc. For a complete list of apps, head over to this link. Oh… so do I need to have a mobile/tablet to enjoy these services? Well, no. You can enjoy the same from your Google Chrome Web Browser (version 28 or higher) in the PC. Anything that appears on your Chrome browser can be cast to the TV(either as individual tabs or as an entire screen(currently in experimental)). To enable the service, you just need to go to this Chrome Web App Store and download the Google Cast extension. Once installed, you will see the Cast icon next to the video player when you visit the supported websites (like Youtube) and you can cast the video directly to the TV screen. a mobile/tablet device with the Chromecast app installed or Chrome web browser with the Google Cast extension. If the TV has only an HDMI port like the one I tested, Google has provided a power adapter which you can connect to the wall port and charge the device. If you still have an older version of TV which does not have the HDMI port, don’t feel sad because there is always a way out, you just need a couple of extra items to get started! I’m currently in the process of testing this possibility, and watch out this space for updates on that. Reviews have confirmed that it will work on older TVs, so yes expect the good news soon. UPDATE! : Here’s some good news. Your old TV is about to get a lot smarter. 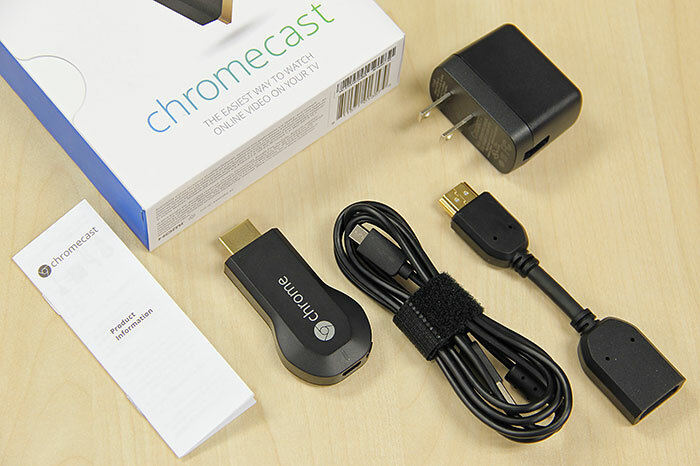 Yes, Chromecast will work on your no-HDMI no-VGA RCA-only TV. How? Read on. Ok good, So how did the testing go and how to set it up? Well, it did go really well in the end even though it scared me a bit in the process. I received the device in my office, and I couldn’t resist the urge to test it right away. The TV in the meeting room was free for the experiment, and so was I. The package is small and really well designed. It comes packed with the Chromecast device, a microUSB to USB cable for charging, an HDMI extender for those wall-mounted TVs which have the HDMI port at awkward positions to reach, and a power adapter to which you can connect the supplied USB cable and plug it to a wall socket. I almost forgot the small manual booklet for basic instructions and device details. Now, one thing to note here is that the power adapter is designed for US wall sockets (see pic). So if your area does not support this adapter, be sure to get hold of a converter or a different supported adapter to which you can connect the USB. Now as mentioned earlier, the TV that I tested had the HDMI port only, and was missing the USB port. So I had to use the adapter…well I couldn’t because the socket supports only UK-type adapters. So, a little break until I brought a different adapter which suited my wall socket. I connected the USB cable to the adapter and plugged it in, and here we go. The Chromecast opened its eyes and started blinking lights. A good sign, indeed! I connected the device to the HDMI port of the TV, and browsed to the HDMI-input of the TV. The device started to boot up and within a few seconds, I got the beautiful wallpaper with a message – Set me up! and an instruction to go to google.com/chromecast/setup. The link will tell you to download the Chromecast app in your mobile device which I already did in my Nexus 7, or the Chromecast Installer for the browser. So I fired up the app, and immediately it started searching for nearby chromecast devices and it discovered the device. A pairing password same as the one displayed on the TV will be shown to complete the pairing. Proceed with it, and the pairing is done. It’s basically very similar to Bluetooth pairing setup. So the pairing is completed. Now you need to finish the remaining set up. Proceed to name your device, and connect it to the same WiFi network as your mobile device to complete the process. Now, this is where I hit a wall. The device did not connect to the Wifi network – the reason being the WiFi network in question uses a web login to authenticate you. Chromecast does not have a browser interface to enter the credentials to complete the process, so it returned an error message saying it couldn’t connect. If you have a secure wifi network where you enter the password as a pin when you connect, then you don’t need to worry about this. Simply enter the pin and device will connect within no time. Use a PC and spoof the MAC address with the same MAC of the Chromecast device and connect to the wifi network, let the MAC get registered and then disconnect the laptop and reconnect the Chromecast to the same network. This would work but you will be required to repeat the process and login at regular intervals once the session expires. Again, you can go to the console settings of your wifi controller interface and set it up to bypass the MAC address of the device so that next time the device can connect directly without any authentication prompt. This would be a matter of concern for those who are travelling and staying in hotels which provides a wifi network with web login (in fact most hotels have this process to authenticate the guests). You cannot go and ask the IT person to bypass the MAC address of your device in their system so you can stream videos in your TV. So carrying a laptop would help in such cases. Ok, back to the testing. I did this 3G-hotspot thing and set up the Chromecast. The device promptly rebooted, and directly started to pull an update (no idea what that was for, is it firmware update or additional data download maybe?) So another 5-10minutes and cleaned some more MBs from the 3G package and finally got ready for action. The Chromecast app also nodded in agreement with a ‘Ready to cast’ message. Now, close the Chromecast mobile app because you don’t need this app for a while. Let’s see how the streaming works now. I went directly to Youtube app. There, the Chromecast icon was already available. So without further adieu, I played one of those HD videos from MKBHD and pressed the cast icon. Here we go! A second later, the video showed up on the TV screen and started playing without any hitches or buffering problems. At this time, the Youtube App in my Nexus 7 became a remote for this TV. I could pause the video, skip back and forth, adjust volume, play another video, or just hit the home button and continue using other apps while the video played in the TV. So it doesn’t require you to stay within the app for the duration of the streaming. You can exit and the progress will be available in the notification panel from where you can control the video playback. The idea here is, that once you tell the Chromecast to play a video, it takes the command, searches for it and starts streaming the video on its own. Pretty straight-forward stuff, right? The other apps also work in the same manner. You can go to the app, start playing the video and hit the cast icon in the app. The rest of the story would be played on TV. Similarly, once you pair the device with the Chrome browser, you can hit the cast extension from any tab and start streaming the specific tab or the entire screen! (although the full-screen stream option is not 100% guaranteed to work, reviews suggested that it works just fine). That’s it! Google Chromecast set up is that easy. Plug it, Pair it, Play it. I would try to get some screenshots or photos to give a visual of the steps). I got the HDMI Composite Converter (HDMI to RCA), and tested it straightaway in the TV (no HDMI or VGA ports) in my home. There is no HDMI or VGA port in this TV, just the RCA ports. The converter came with a power adapter and so I did the connection as shown below, and browsed to the AV input of the TV. And here we go! The Chromecast start page with the beautiful wallpaper was already there. The setup process was just the same as described above. Plugged everything, paired the tablet/laptop and Chromecast, and fired up the Youtube App. The video played without any issues, except for occasional hiccups in connectivity/streaming while playing the video. I’m not sure what caused these pauses, but I noticed that the pauses were more frequent when playing higher-quality videos. Other than that, the Youtube app works seamlessly with Chromecast. I also tried to stream Chrome browser tabs which also worked really well, even though it did not play the videos when played normally from a casting/streaming browser tab. So yes, the converter worked as advertised. Even though Chromecast is available worldwide, many of the existing supporting streaming partners (like Netflix, Hulu Plus etc. )are region-specific. So if you are not from the countries that support these apps, then your options are limited. But you can still enjoy Youtube, Chrome browser (any website that you can open in it! )and other available apps. Don’t worry, the future for Chromecast is very bright. Plenty of apps are on their way! So no need to hesitate to get this one. For those older TVs which don’t have HDMI port, you will need an HDMI to Composite converter (costs more than the Chromecast itself!!!) to convert the digital signals to analog and then use an RCA cable to connect to the TV (Good luck with the shipping though if you are purchasing online). Those who connect to the WiFi network which require a web login are in for a bumpy ride, you have to look for alternate options (couple of them mentioned above) to connect the device to the network. So here is it. It got pretty long, but I hope you are still with me! Let me know in the comments section on your experience with Chromecast and if you have better ideas of getting it to work, please do share them below. This entry was posted in PC & Tech Tips and tagged beginners guide to chromecast, chromecast how to, chromecast review, chromecast TV has no HDMI port RCA, chromecast wifi web login issue, hdmi to composite converter chromecast, how to set up chromecast by vimalsuresh. Bookmark the permalink. I have old TV only rca. Bought exact same adapter, get flash of chromecast then blurred scrambled lines. Looks to be converter as chromecast works with HDMI TV fine. I had the same experience, read somewhere that some work and some don’t, converters i.e. Pl. let me know if you had any luck since the last time you tried!